Another cracking plugin by ValhallaDSP that makes a great Lexicon-style wingman to ValhallaRoom. Cheaper than a parking ticket. Great character and tone. Simple, clean layout. Classy modulation. No offline manual. Not a reverb for every occasion. 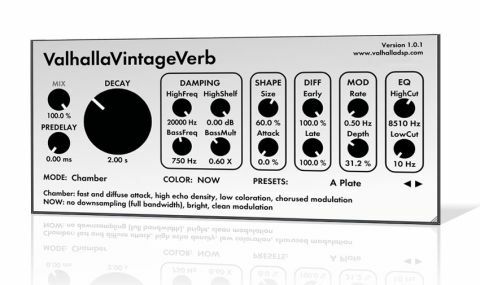 ValhallaDSP's latest plugin, VintageVerb (VST/AU/RTAS), is a nostalgic take on the curiously crusty hardware reverbs of yesteryear. At its heart are nine mostly Lexicon-inspired reverb algorithms to choose from, covering the usual array of halls, plates, rooms and spaces, as well as a few more esoteric designs. All stand up very well in the mix, but our favourite is the Chamber algorithm, with its beautifully smooth yet dense texture - a combination that a lot of reverb plugins don't quite manage to pull off. "Color modes use modulation shaping and internal downsampling to replicate three different 'eras'"
Where VintageVerb really departs from ValhallaDSP's flagship ValhallaRoom reverb is in its three Color modes. These use modulation shaping and internal downsampling to replicate three different 'eras': 1970s gives a grungy, lo-fi texture, 1980s steps the quality up somewhat but still sounds pretty gritty, and Now gives you today's squeaky clean sound - see Vintage king for more. This simple decision to have the Color as a separate option, rather than building it into the reverb algorithms themselves, results in an impressive level of sonic flexibility without sacrificing simplicity and ease of use. Although it doesn't offer the same level of control as its older brother, ValhallaRoom, the Lexicon-style parameters that VintageVerb does give access to are straightforward and to the point without being overbearing. "When you need a potentially enormous reverb tail, it's just the ticket"
The big Decay dial sets the reverb time, ranging from a short(ish) 0.2 seconds to a staggering 70 seconds. Next up are the Damping controls, providing basic high shelving from 100Hz to 20kHz, and Bass Multiplier, which multiplies the Decay time of signals below your chosen cutoff point (100Hz-10kHz) by anywhere between 0.25 and 4, giving independent control over the tail length for the low and mid/high elements of the signal. Indeed, VintageVerb begs to have that top end opened up, letting its gorgeous, airy highs wash over you, never sounding harsh or abrasive. The Size dial sets the room size, of course, helping to achieve anything from a bold, upfront sound to a less defined, more spacious reverberation. Coupled to this, the Attack setting determines how long it takes for the reverb to kick in, functioning thus in all modes except Ambience and Sanctuary, where it controls the level or balance of the early reflections. The density of the reverb is controlled by the Early and Late Diffusion settings, with higher levels giving that characteristic heavy ValhallaDSP texture. Finally, the Modulation Rate and Depth knobs control the amount of chorus applied to the tail, while High- and Low-Cut filters are on hand for final tonal adjustments. While VintageVerb certainly isn't as flexible as ValhallaRoom, when you need an 'unreal' and potentially enormous reverb tail in that classic Lexicon sense of the phrase, it's just the ticket. Subtlety isn't its strong point, as even its shortest reverbs really leave their mark in the mix, but if you're looking to bring a bit of high-gloss spatial magic to your DAW without breaking the bank, this one comes highly recommended.